ITB therapy offers significant relief from spasticity and is also used to treat pain…..
Intrathecal pump is a device used for chemical neuromodulation of central nervous system to significantly reduce spasticity and pain. It involves implantation of hardware to deliver the drug. In simple terms it is a completely internalized system comprising of an intrathecal catheter connected to a drug reservoir sited in superficial subcutaneous pocket. Administration of a drug into the subarachnoid space directly acts on the target receptors present on the dorsal horn cells responsible for pain transmission. The intrathecal administration permits the drug to bypass enteric absorption and/or blood brain barrier hence the dose required is a fraction of systemic dose with improved efficacy and minimized side-effects. For example, dose of baclofen from oral to intrathecal route decreases from approximately 300mg to 1mg. The continuous drug delivery ensures a steady drug level in blood, improving quality of analgesia. This in short is a modality which provides more effective pain relief with better safety profile. There are a number of drugs used with the system but three drugs which are at present FDA approved are Morphine, Baclofen and Ziconotide. 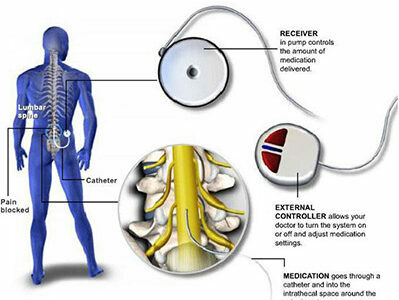 Intrathecal drug pump is a very sophisticated and programmable system. It involves two stages. First is a trial which is important to determine whether this particular system will suit that individual or not. It is like test driving a car before buying. Trial is performed to assess patient’s response to spasticity and improvement in side effects. We perform trial using intradural catheter (not bolus), which is implanted in strict aseptic conditions at the desired target site. The patient is assessed for the improvement in spasticity after 2, 4 and 6 hours. We usually observe the patient in ICU during this time for increased patient safety. If the trial is successful we proceed with the implantation. After implantation the system is programmed to offer long lasting benefit in terms of satisfactory control of pain. The implantation is performed in OT using fluoroscopic guidance and all surgical asepsis. The two piece silicone catheter is introduced through a special introducer needle and guided into subarachnoid space upto the desired level depending on pain geography and property of the drug used. It is secured to thoracolumbar fascia with special anchor, tunneled in subcutaneous plane and connected to the Synchromed pump by suture less connector on the proximal piece of the catheter. The pump is emptied of its manufacturing fluid and filled with the desired drug before implanting in the subcutaneous pocket. Both the incisions are surgically sutured neatly after adequate haemostasis. Intrathecal pump is available in two main types, fixed rate [Isomed] and programmable [Synchromed] pump. Synchromed has two varieties, an older Synchromed El and newer Synchromed II system. Synchromed II has been an improved version and has been more popular due to features such as lighter and flatter implant, increased drug stability to 6 months, improved low reservoir flow accuracy. It comes in two different sizes 20ml and 40ml reservoir capacity. Improved software of Synchromed II stores all patient demographics and notes up to 1000 characters. It also stores catheter information and system log with last 30 events and patient activation log of last 80 events. This information is most useful when technical support is called for help. The information is presented in scrollable window to accommodate more information with multiple drugs. New software allows drug data up to 5 drugs with first drug as a primary drug. A personal therapy manager (PTM) is a compact device to enable patient to take extra boluses if required for the incidental or breakthrough pain. This gives a better degree of patient satisfaction.